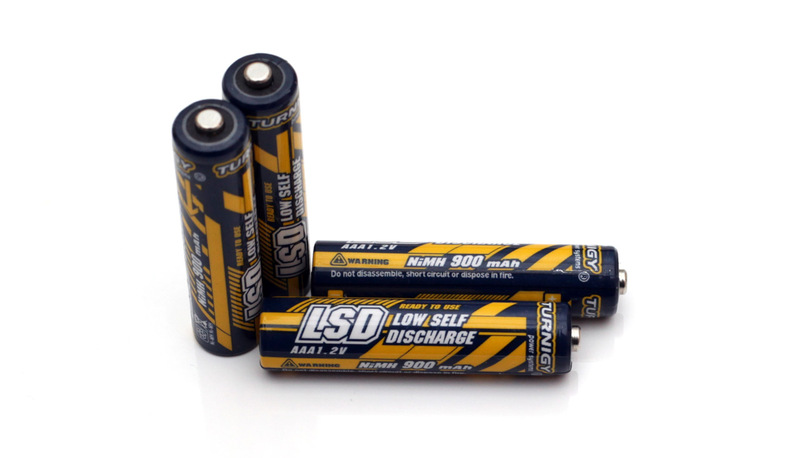 The 1.2V AAA 900 mAh Turnigy LSD NiMH batteries are Low Self Discharge NiMHs as the name suggests, meaning they do loose less of their useable capacity over time compared to traditional NiMH batteries. Turnigy is a brand of one of the largest online RC model stores, namely Hobby King, so these batteries are often used for radio controlled models – for powering transmitters, receivers and even smaller scale models. The price of the Turnigy LSD NiMH batteries is more attractive compared to other similar products, but what about their performance, we are going to find out exactly that now. We have started the test of the 1.2V AAA 900 mAh Turnigy LSD NiMH batteries as we normally do with a low constant current discharge rate of 0.1A and getting 1068 mAh as a useable capacity is really a good result with significantly higher capacity than what the batteries are rated. In fact the performance of the 900 mAh Turnigy LSD is very close to the one provided by the 950 mAh Powerex Imedion LSD NiMH batteries that we’ve tested recently that also performed great. Increasing the load we test at and we still got great performance out of the Turnigy batteries, so they are great and affordable solution and the only problem is that you can only order these online from some of Hobby King’s warehouses in different countries. There are many types of single use and rechargeable batteries available out there and you have many options for use in devices that operate on the more common types of batteries, but the important question is what types of batteries will work best in different devices and situations? Starting with Carbon-Zinc batteries, these you would probably want to avoid as they are just a bit cheaper than the more standard Alkaline batteries, however their life and capacity are usually a few times less than what a standard Alkaline battery would offer, let alone a high capacity ones. So go for Alkaline batteries in devices that do not require a lot of power or are not always on such as remote controls for various devices, Alkaline batteries are also good for low power consumption device that are operating all the time. You can of course also use Alkaline batteries for devices that require more power such as a digital camera or a flash for a digital camera if you are not using it very frequently for example. If you are looking for batteries that need to handle higher current loads frequently, then you better think about going for rechargeable instead of primary batteries. So, going for rechargeable NiMH batteries, but what type to use – the standard HiMH or the newer Low Self Discharge ones? Well, again it depends on the device you are going to be using them in. For example the standard NiMH batteries are not the best choice for use in low power devices such as remote controls, because of their faster self discharge even when not being used. On the other hand you can go for LSD NiMHs in a remote control without worrying about them self discharging in a year or two even if you don’t use the remote. Now, we said you can use the LSD NiMHs for low power applications, but for a remote control for example Alkaline batteries might be much better choice because they should normally last for a few years and will be much cheaper than a NiMH battery. The real strength of NiMH batteries is that they can handle pretty well in high load applications such as digital cameras or flashes that you are going to be using a lot and very frequently. Usually with NiMH batteries you would charge them right before you plan on using them with the idea that they will most likely be discharged from use like for example going to an event where you will take a lot of pictures. With LSD NiMHs you don’t need to recharge them right before you plan on using them, so it is more convenient, not to mention that when you pick them up at a store they will be pre-charged and ready to be used unlike with standard NiMHs that need to be charged prior to being used for the first time.